Exporter of a wide range of products which include copper spice box, stainless steel spice box, masala dani spices box, corporate gifting stainless steel bar set and salt & pepper set. 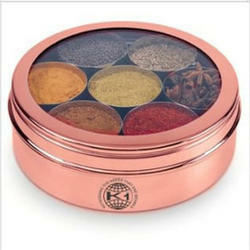 We are highly engaged in manufacturing , supplying & exporting a wide range of Indian Spice Tin Box. These are manufactured by using high quality materials. These are highly appreciated by our valuable clients. These are provided in different specification to meet the diverse requirement of client. Stainless Steel Spice Box also known as masala dani is quite famous and in demand in every Indian house, in fact even in European country it is know by the name of Indian spice tin box. It is designed so well that it is a must requirement of every house and it caters your basic need of salts and other related masalas. It is beautifully designed that enhance the beauty of your kitchen. We are offering a wide range of Masala Dani Spices Box. These are available in different sizes that fulfil the multiple needs in one box of storing different spices all together in one box. It comes with cover and with the lid on the top. 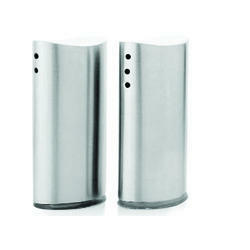 They are available in various sizes and in economical range to fulfil the pocket of every type of house hold person. 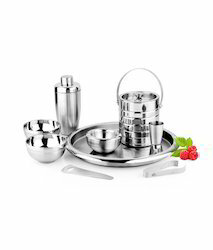 Manufacturer and supplier of Stainless steel designer items for corporate gifting like Kitchenware, Bar Accessories, Office Accessories, Utensils, Home Decore & other promotional items.